Autumn is a magical time of year on the Cape. From the crisp autumn air, to the spectacular fall foliage and all the vibrant colors that come with it. Come and see for yourself why fall is the Cape’s most wonderful season when you book your stay at the Dan’l Webster Inn. We recommend our romantic Jarves Suite, luxuriously appointed Webster Suite or our elegant Fessenden Suite for your fall getaway. Relaxing in an oversized whirlpool tub or lounging in front of a warm fireplace is the perfect end to your day! 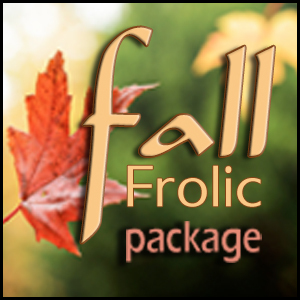 The Fall Frolic Package at the Dan’l Webster Inn includes one night’s lodging along with a breakfast voucher, a lunch or dinner voucher and a variety of seasonal treats, including a bottle of Martinelli’s Gold Medal Sparkling Cider, Bogs Frogs chocolates and a jar of locally made Green Briar Seasonal Jam. The package is available through November 20th. Goodbye, crowds! Cape Cod in the fall isn’t about avoiding the tourists, rather, it’s about enjoying the Cape like a local and experiencing the tranquility that this part of New England is known for– without all the summer bustle. Some may worry that Cape Cod has less to offer in the off-season, when in fact, the opposite is true! Less traffic means it’s easier to visit other parts of the Cape, you’ll be able to check out the beaches without worrying about parking and you can also go to all the restaurants you’ve been avoiding because of the long wait lists, even on the weekends! The crisp, salty autumn air is a reason in itself to get out on a boat in the fall. There’s also no better way to enjoy the coast’s magnificent fall colors and fewer boats on the water makes for a more tranquil excursion. Some of the best fishing around the Cape’s waters happens in the fall, too. Bluefin tuna are usually around, so this is really a prime time to fish. There are plenty of boating and fishing tours and charters available in the area. Just be sure to pack extra warm clothes if you’re planning to get out on the water, it can get quite chilly in the late fall months. If you're planning to visit in October or November, you can also bring your surf fishing rods and try your luck casting and catching from the beach. Fall is the perfect time to get some fresh (chilly!) air and enjoy Cape Cod’s natural beauty. The Cape has more than 100 well-maintained public walking trails and 114 total miles of bike paths. Each town on the Cape offers several trails to explore, many of which meander by beaches, salt marshes, cranberry bogs and bird sanctuaries. If you’re feeling extra adventurous, the Great Island Trail on Cape Cod’s National Seashore is considered by many to be one of the best hikes in all of Massachusetts. The 7.5 mile trail starts with a relaxing walk along the shoreline, makes a climb into a pine forest and offers incredibly breathtaking cliff-top views overlooking Cape Cod Bay. If you continue along the trail, you’ll discover a small stone monument that marks the spot where a 17th century whaling tavern once stood. The trail continues through the forest, and ends with a breezy walk along the beach. Each fall, Cape Codders celebrate the seasonal specialities, from scallops and oysters to cranberries and cider. Some festivals worth checking out include the Wellfleet Oysterfest (mid-October), the Fall for the Arts Festival (October-November), and the Sandwich Pumpkinfest (late October). And who can forget all the Instagram-worthy pumpkin patches! They’re plentiful during the fall.